Last week was a big week for LJF. 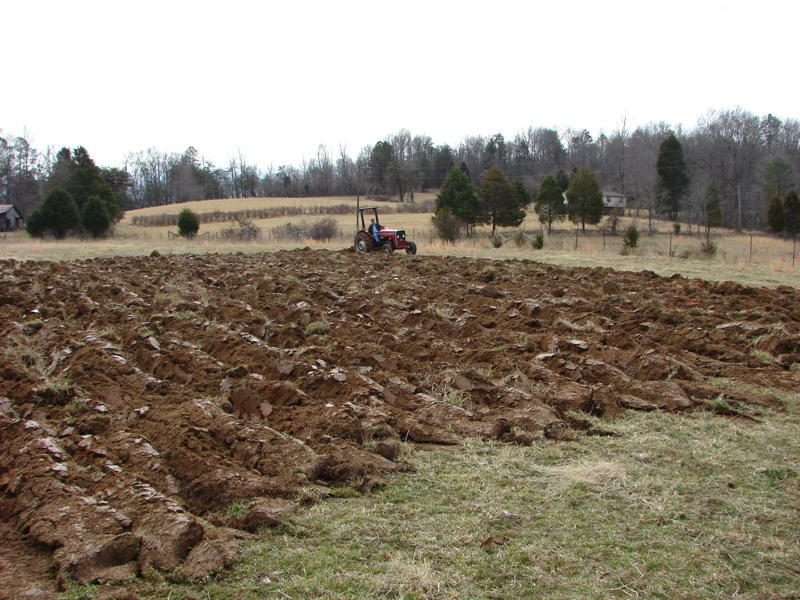 We hired a man to do some plowing and tilling with a tractor. 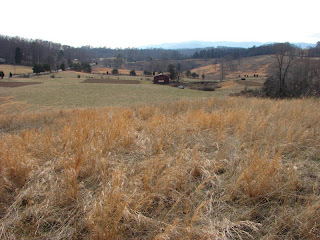 One acre is now scratched open and needing planting. The hayfield will take it all back if we are not quick about it. We will be planting feed corn and fox tail millet for poultry feed, market veggies and potatoes. The plan is to under plant clover as a green manure/ living mulch for the corn. We will pre-treat the clover seed with organic inoculant. The inoculant is a specially selected strain of nitrogen fixing bacteria that will colonize the roots of the clover, and grow in nodules that secrete nitrogen into the soil. Since corn is a nitrogen hog (and depletes the soil readily) we are doing this to eliminate the need to treat the field with petroleum based fertilizers. This is considered a "deep organic" method as described by the organic gardening guru Eliot Coleman. The idea is not to just use processed organic fertilizers but to amend the soil and improve it. Chemical additions,be they organic or petroleum based, do not offer a long term improvement to the soil. In fact, they can burn and kill earthworms and beneficial insect (yes, even if they are organic). The only other amendments will be manure and compost. Later in the season the clover will be knocked down and in-planted with Oaxacan Green Dent Corn. I tried to pick a heirloom variety from a region with a similar humidity and growing conditions to East TN. I may be wrong about the selection, but that is how things go, you try and see what works. I also have a batch of Ohio Blue Clarige from Broadened Horizons Organic Farm. This is a landrace corn that the farm has developed over successive growing seasons. I will plant it on another schedule so it won't tassel at the same time as the Oaxacan so it doesn't cross pollinate and resemble nothing like we intended. Now the preparation paralysis is over. Planning has to give way to action. The non-romantic truth of the matter is that I have 1253 feet of property line without any kind of fence. The perimeter fence is the last barrier to farm critters making a break for it. It is also the first barrier to critters that want to get in and make a quick meal of my livestock. I worry about coyotes the most now, but then I worry about weasels, rats, owls, hawks and now bald eagles that frequent the lake a quarter mile away. Don't even get me started about people's pet dogs roaming the area looking for blood. This is the secret life of some dogs unfortunately, one that would shock the most loving of dog owners. Everybody loves chicken. William lost about a dozen birds to a roaming Husky last summer. He captured the dog and had a nice conversation with the owner. All was set right with a check to cover the value of the birds. "You lick your owner's face with that tongue doggy?" Sinister, but the dog-ness of the dog I suppose. This weekend we went out to the property to take a walk around the perimeter, check the existing fences and pick out a place to put our driveway and cabin. We decided on the driveway and cabin, and walked the entire property line checking out the property line fence and seeing how it must be fixed. The old fence is rough in places and is not up to snuff. 1253 gets bigger. This will likely be a really good fitness plan for William and me, more for William I suspect who will wind up bearing the bigger part of the work. There is just a limit to what I can do with a day job. We were also happy to meet the neighbor across the street who has lived there for 50 years. She is a very friendly person with a big smile. We got the strange look we sometimes get when we mention organic farming, but when we explained; no chemicals, no poisons, lots of manure and lots of compost, a big smile came over her face. "Oh, so you are going to farm the old way." she said. Yes neighbor, the old way. Call us crazy, and insanity may soon come to pass. Jumping into the Tennessee countryside. This is the story of 15 acres, starting from the beginning.